All Personnel is a Temp Jobs, Employment, and Payroll Services company in Mississauga, Ontario. They provide qualified, experienced personnel to the transportation, warehousing, and distribution industry. 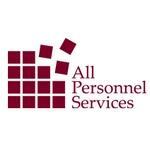 All Personnel Services is a privately owned Canadian company founded in 1995. Products Carried: All Personnel is Southern Ontario's Premier Staffing Service. Located in Mississauga, ON, All Personnel is a full employment agency providing workers for short term, long term, and permanent positions. Such job placements with top Canada companies include: AZ or DZ Drivers, Forklift Operators, General Warehouse Workers, Data Entry Clerks, Office Cleaners, and more. All Personnel has more than 40 years experience in the staffing industry.